As you may or may not have already read, Melissa has accepted a job at Washington University in St. Louis. 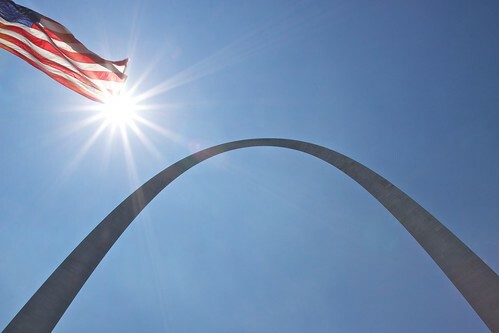 We will be moving to the St. Louis area in mid-August. 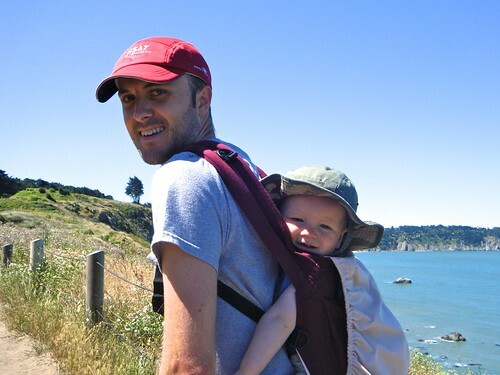 I will continue my current job, working from home (much as I did for the year we lived in Nicaragua). It will be a little sad to leave Champaign-Urbana where I've lived for 13 of the last 14 years. 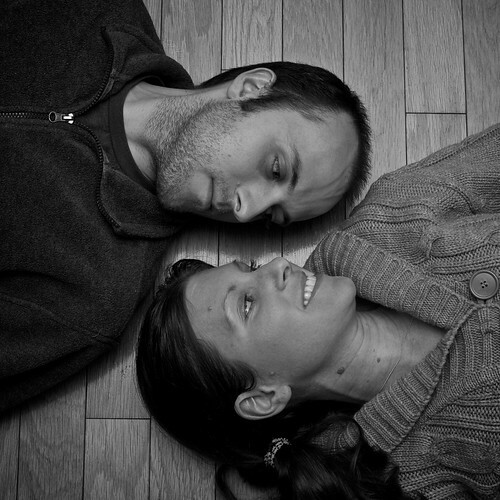 However, this job is a really great opportunity for Melissa and we're both excited to be starting a new adventure. Wish us luck. Here's to another nine years (after that we'll play it by ear). Two years ago when I ordered my Bike Friday Pocket Rocket, I opted to go with the Shimano Capreo cassette/rear hub combination. This system is specially designed for small wheeled bikes (the Pocket Rocket has 20" wheels). Normal cassettes need to have at least 11 teeth. Since the Capreo system has a smaller spindle (at the end) it can go down to 9 teeth. 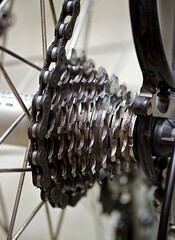 This allows higher gear ratios on small wheeled bikes without using bigger chainrings. 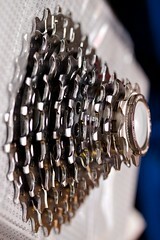 The 9-speed Capreo cassette only comes in one configuration: 9-10-11-13-15-17-20-23-26 teeth. This is a fairly wide range of gears with 119.4" at the high end and 30.4" at the low end. This is a great general purpose range of gears that will work for everything from ascending a mountain to descending a mountain. Unfortunately, I live nowhere near any mountains. Champaign County Illinois is the flattest place on earth. So I don't need all the low gears, but I would like to have a set of gears which are closer together so there's not a very big jump when I change gears. The thing about the Capreo cassette is that the smallest four cogs are a non-standard size and they all fit together in a special way. 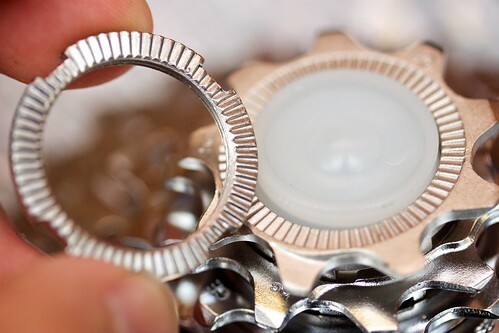 The hub spindle is too small for cogs from any other cassette to work. So the 9-10-11-13 tooth cogs are essentially fixed. The largest five cogs are all standard sized, so I could replace all those with different sized cogs. The first challenge is removing the Capreo cassette. Since it is a non-standard size a standard cassette removal tool won't work. 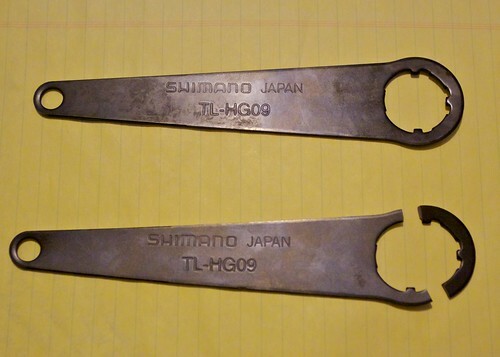 Shimano makes a custom tool, which I purchased a while back (from England, since none were available in the U.S. at the time), though I haven't used yet. I whipped out the tool, positioned it on the cassette, and the instant I turned (before applying any real force) the brand new metal tool snapped. Sigh. So now I have to replace that tool. On the bright side I happen to live four doors down from a friend who also owns a Bike Friday with a Capreo cassette. Gary was nice enough to let me borrow his (also unused) tool despite the very real chance I might break it as well. I eased into it and the tool didn't break, but it did take quite a lot of force to remove the cassette. The Capreo cassette's lock ring has large grooves which must be turned against each other to remove the cassette. With the cassette off I was able to scavenge cogs from two other 9-speed cassettes (now that I've upgraded my road & TT bikes to 10-speed drivetrains) to produce a mutant hybrid cassette much better suited to the flat lands of central Illinois. 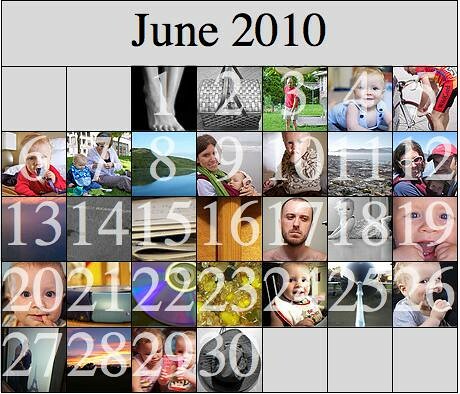 I ended up with 9-10-11-13-14-15-16-17-19 tooth cogs. This cut the percent differences between gears roughly in half. I really wish I could get a 12 tooth cog in there because the 11-13 change is still 18.2% apart! Alas, the 13 is fixed for the Capreo cassette. I tested out the new gears yesterday pulling Fig in his trailer. Even dragging the trailer/parachute into 25mph gusting headwinds the low gears were perfectly adequate. I ran the Freedom 5K this morning at 11am. 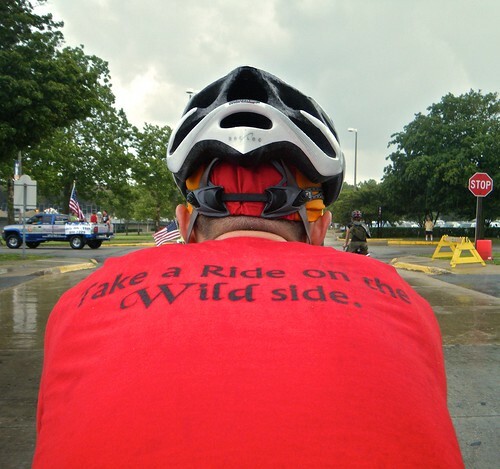 It was 90˚ and sunny, very undesirable conditions for a short, fast, violent effort. On top of that my legs weren't moving quite right after 75 miles of cycling yesterday. Yeah, that was a bad idea. For some reason this race has way more competition than all the other local 5K races. All the area high school runners show up, which is not typical. This means about 20 runners will finish under 18:00, whereas a typical local race will have 2-5 runners that fast. Of course, the race started super fast. 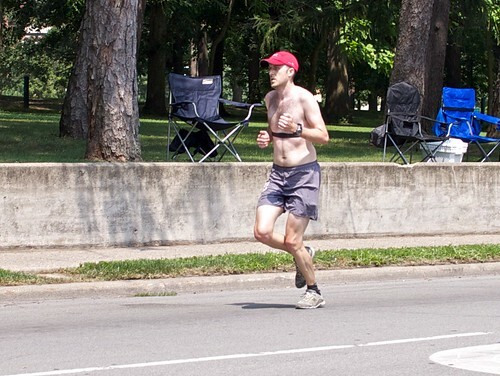 I was well off the leaders' pace and I still passed the 1-mile mark in 5:32. Ugh, too fast. It was blazingly hot and I started to fade. My second mile was slower, and my third mile was even slower. I finished around 20th place or so. The clock read 17:55, though my watch read 18:09, a substantially larger discrepancy than usual. Other runners mentioned the same thing. I wonder what the official time will be... The race went okay, considering the horrible weather. 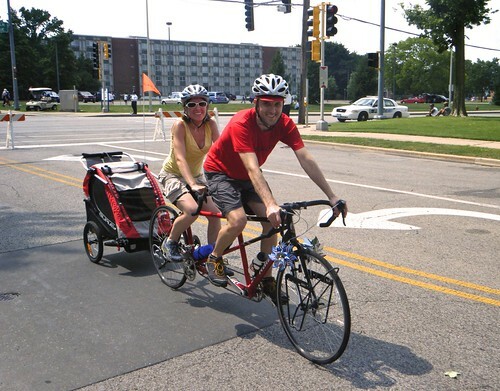 After the race I quickly changed gears and got the family ready to ride Big Red in the parade. 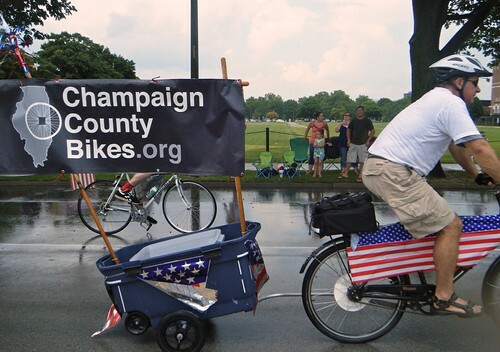 Each year the Champaign County Bikes advocacy group invites members to ride in the parade. We've done this a few times before. 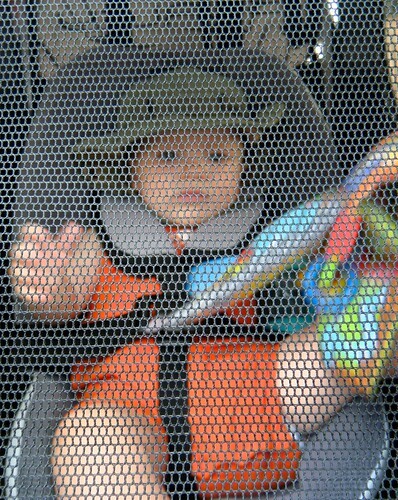 This would be Will's first parade. Again, it was blazingly hot. We stood around in the staging area for a little before finding a tree to rest under for a few minutes. Just minutes before we were to start the parade the rain began to pour. Everyone else ran for cover, but I relished the welcome relief from the heat. I was soaking wet and it was the best I had felt all day. 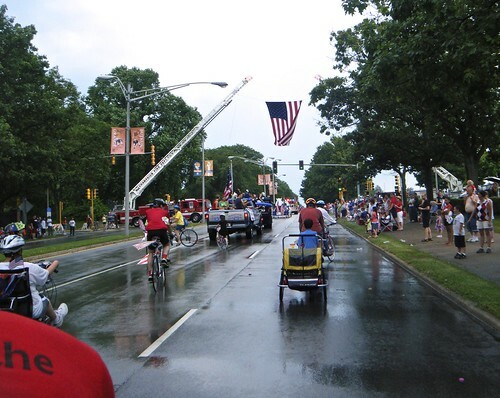 The rain slowed to a drizzle as we began on wet streets. A few blocks into the parade it stopped. By the end the roads were dry. 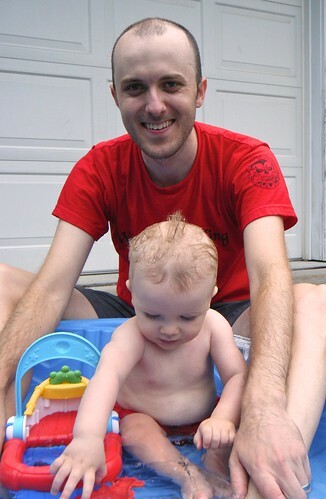 Finally, after the parade Will took his first swim in his new pool. Good times were had by all. We're not watching fireworks right now. The boy's asleep and we're exhausted, so that's probably a good thing. Hmm. I must have done something wrong here. First it was a week in California with no running. Then I sort of injured my foot slightly and it took about two more weeks before I could run again. The good news is I'm running again. The less good news is that this is the worst time of year to be running. I'll probably stick to running once or twice per week to maintain my fitness until it cools down in the fall. It's cycling season anyway. 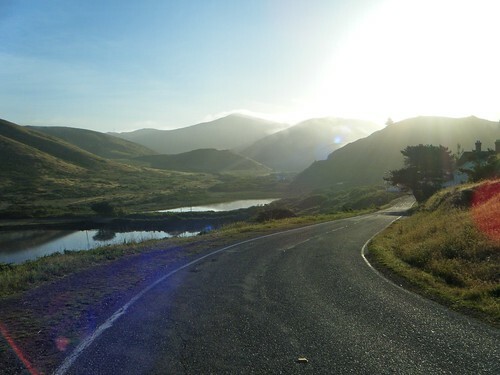 I did a fair amount of cycling in California, which was great. 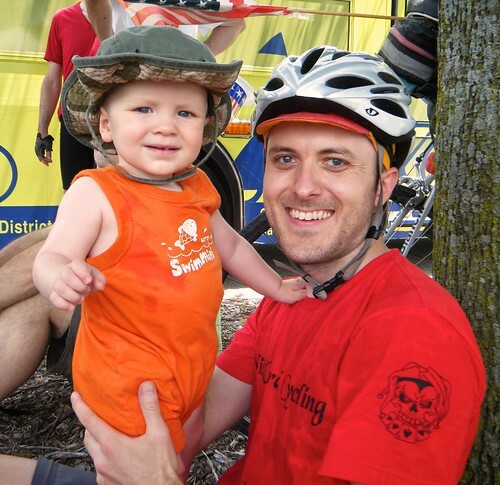 I also did the Illinois State championship road race (O'Fallon) and criterium (Peoria). I had not results worth mentioning, but I was happy with my performance in both races.